The San Juan Archipelago consists of approximately 418 islands, reefs, and rocks at high tide. 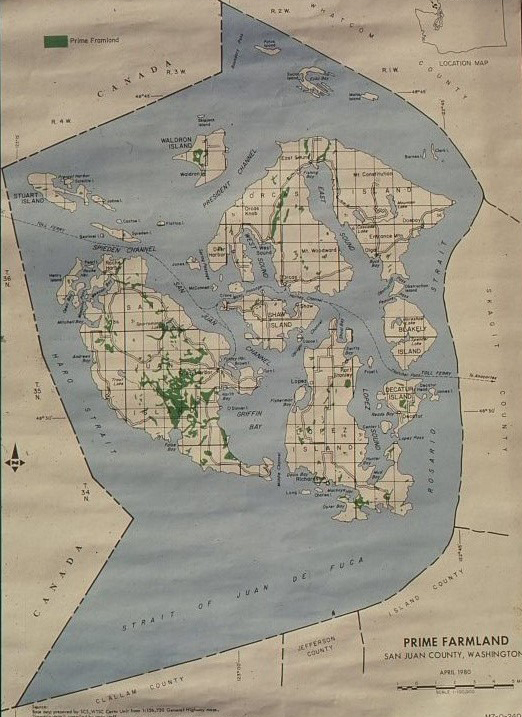 Located in the northwest corner of Washington State, the islands are bounded by Haro Strait to the west, Boundary Pass to the northwest, the Strait of Georgia to the north and northeast, Rosario Strait to the east, and the Strait of Juan de Fuca, as well as the northern portion of Puget Sound, to the south. The surrounding region has often been called the Salish Sea, defined by the surrounding land masses of the Olympic Peninsula to the south, Vancouver Island to the west, and the mainland to the north and east. The islands have more than 407 miles of marine shoreline and approximately 172 square miles of ground surface, with the three largest islands (comprising about 80 percent of the overall land mass) being Orcas (57 square miles or 36,432 acres), San Juan (55 square miles or 35,448 acres), and Lopez (29 square miles or 18,847), with Shaw, Blakely, Waldron, Decatur, Stuart, and Henry (in order of size) being 1,000 acres or more. During the Pleistocene Era, a series of three great glaciations occurred, with the ice reaching as far south as modern day Olympia, filling the depression known as the Puget trough and leaving only the surrounding mountain ranges uncovered. Upon their recession, the glaciers not only scraped the existing rocky areas, but also left behind glacial till, as well as the large boulders, called erratics, that can be seen standing unmoved in the middle of farm fields and pastures. After the release of the weight of the glacial ice, the islands gradually rose in a process called elastic rebound. During the same period, however, the melting of the receding glaciers also caused a gradual rise in sea level, so that the result of these forces led to a series of shorelines that have differed from the current one. 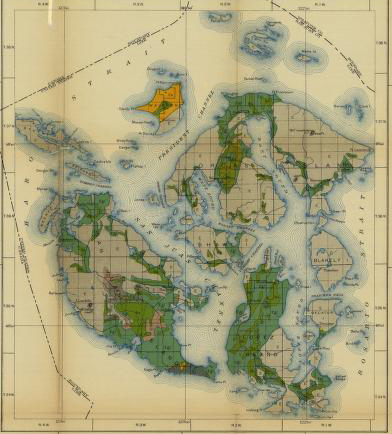 In all probability, all or most of Beaverton, San Juan, and West valleys and other lower areas on San Juan Island was under the ocean at one time. This, together with the glacial action, resulted in the current general soil Bellingham-Coveland-Bow association of low-sloped, poorly-drained soils interspersed with small outcrops or ‘islands’ of Roche-Rock complex. These soils usually have a profile of 18-30 inches above a relatively impermeable clay subsoil that is locally referred to as ‘hardpan.’ The other soil association—Roche-San Juan—occurs in the uplands and other rocky settings, with better drainage (Russell 1975; Schlots et al 1962). The islands exhibit a wide degree of relief. There are numerous rocky knobs, including 15 mountains that rise 1,000 feet above sea level, with Mt. Constitution on Orcas being the highest at 2,409 feet in elevation. The glaciations of the islands led to areas of low relief, such as glacial plains and gently rolling and basin-like areas, exemplified by San Juan Valley, Crow Valley on Orcas, and several parts of Lopez. Drainage comes through short, intermittent streams. After glaciations, the landscape of the islands evolved from open, savannah-like prairies to forested areas; cedar, Douglas fir, and their respective plant communities arrived only 3-4,000 years ago. The more extensive prairies contained well-drained black soil with scattered Garry or White oak (Quercus garryana), while the forested communities were largely composed of Douglas fir (Pseudotsuga menziesii), mixed with western hemlock (Tsuga heterophylla), white fir (Abies grandis), Sitka spruce (Picea sitchensis), and western white pine (Pinus monticola). Deciduous trees such as red alder (Alnus rubra) and bigleaf maple (Acer macropyllum) are also present, particularly in disturbed areas. Lower elevations contain stands of Douglas firs mixed with lodgepole pine (P.contorta). Wetter soils support grow of western red cedar (Thuja plicata), while some of the drier areas have scattered growth of madrona (Arbutus menziesii).